Australia’s Highest Skydive, landing on the beach. Any skydive is an incredible and sometimes life changing experience – especially if it is Australia’s Highest Skydive. Lifting your day to EXTRAORDINARY, the freefall provides a level of feelings and intensity that is seldom found elsewhere. Followed by the counterpoint of a parachute ride allowing time for the experiences to sink in, as you look around and feel like a bird, flying through the sky on your way back to our beautiful planet earth! THAT SOUNDS GREAT, BUT WHAT ABOUT THE BEACH AND AUSTRALIA’S HIGHEST SKYDIVE? 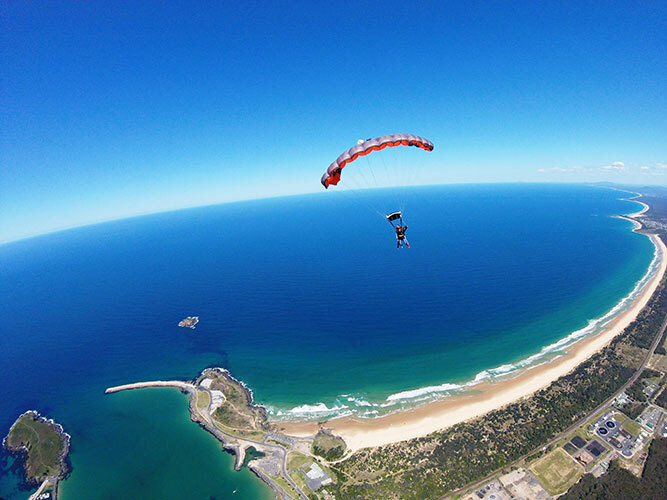 How about we skydive over 300km of pristine coastline, add a backdrop, the Great Dividing Range, landing on the beach in the pristine Solitary Islands Marine Park. Imagine standing on the beach, your hearts pumping, feeling totally blissed out, you’ve just landed! You look to the waves, then back up at the sky, and realise “I can fly”! I can tell you, it’s the best feeling on earth!! What I’ve described just isn’t enough for you? You want the highest freefall there is to with the highest skydive? Wow, the Highest Skydive in Australia, landing on the beach, take me there NOW! We jump at up to 15,000 feet. That’s 4.57km high in the sky – the highest skydive possible in Australia! On the beach – Park Beach in Coffs Harbour, only a short drive from the Coffs Skydivers drop zone.